University of Victoria Russian Language Test Centre | Центр тестирования по русскому языку как иностранному в университете Виктории | What is TORFL – ТРКИ? What is TORFL – ТРКИ? The TORFL - ТРКИ (Test of Russian as a Foreign Language – Тестирование по русскому языку как иностранному) is the official Russian state testing system developed by Russian language methodologists to objectively assess a person's Russian language skills. Employers in Russia and international companies outside Russia can make a decision about an applicant's ability to fill a certain post based on the test results. TORFL - ТРКИ certificate is internationally recognized proof of your Russian language proficiency level. The TORFL is included in the Association of Language Testers in Europe (ALTE). Levels of proficiency in Russian as a foreign language have been harmonized with those used for other languages through the Common European Framework of Reference for Languages (CERF). How can I find out what my Russian proficiency level is? If you are a student learning Russian language at a Canadian university, the chart below will give you an idea of what your level might be. You can also try doing sample tests on our site for various levels to get a better idea what your level of Russian is. What does each level of language proficiency mean? How many class hours are required to achieve each level? Only educational institutions accredited by the Russian government can administer this test. Several testing centres operate in Russia and abroad. 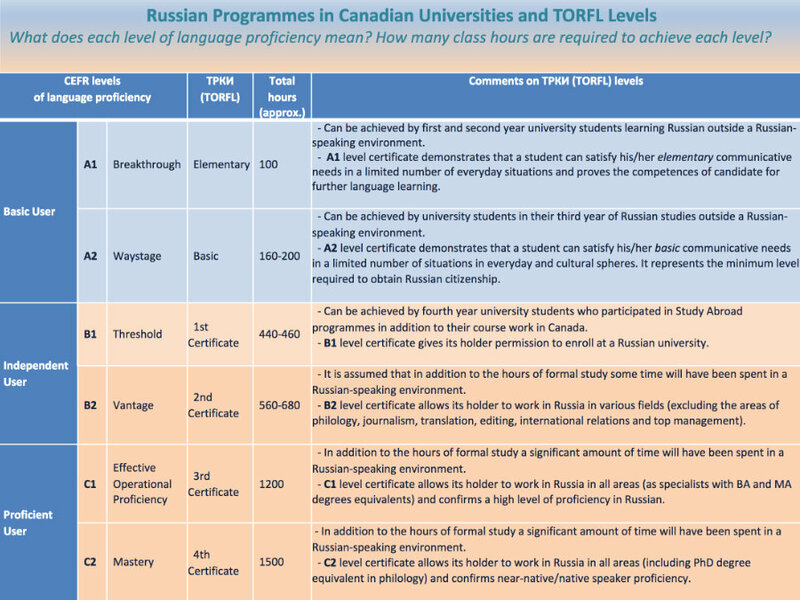 As of today, the University of Victoria is the only place in Canada that has the accreditation to administer TORFL and issue Russian language proficiency certificates. The UVic Russian Language Testing Centre is affiliated with the Lomonosov Moscow State University.